Jamie has arranged the book to take you through ever-increasingly complex forms, starting with pendant style necklaces, both plain and fringed, and moving on to what Jamie calls "totems", which are more complicated pendant forms. Next come necklaces with more than one focal element, from simple panels all the way to a complete collar that sports a whole collection of beads (including the one shown on the cover. From there, Jamie moves to asymmetrical collars or necklaces, and finishes with earrings, a pin, and some bracelets. 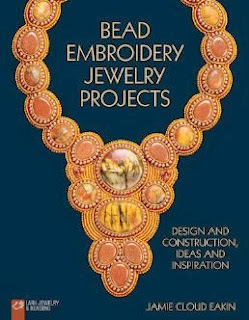 The book encourages you to sizes, styles, and colors of stones and beads, and many many tips are included to help you make your piece truly your own. An interesting tip that Jamie includes involves the necklace bead strand for pieces that have them. She suggests choosing the strand colors before doing the embroidery. I do the exact opposite, but there you have it...see what works for you! 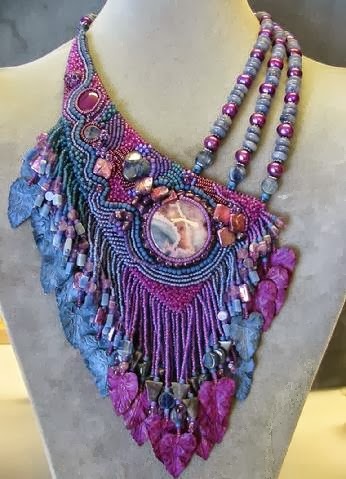 This is why she is one of my favorite bead embroidery artists, even though our styles are so very different: her designs are beautiful, well-balanced, very wearable, and visually delightful. They are not so complicated that it will take you the rest of your life to finish. Yup. I really like her work!